Well, it turns out my five year old is going through a Roman numerals phase so naturally, I'm going to encourage it. So expect a few math activities based on Roman numerals over the next couple of weeks. 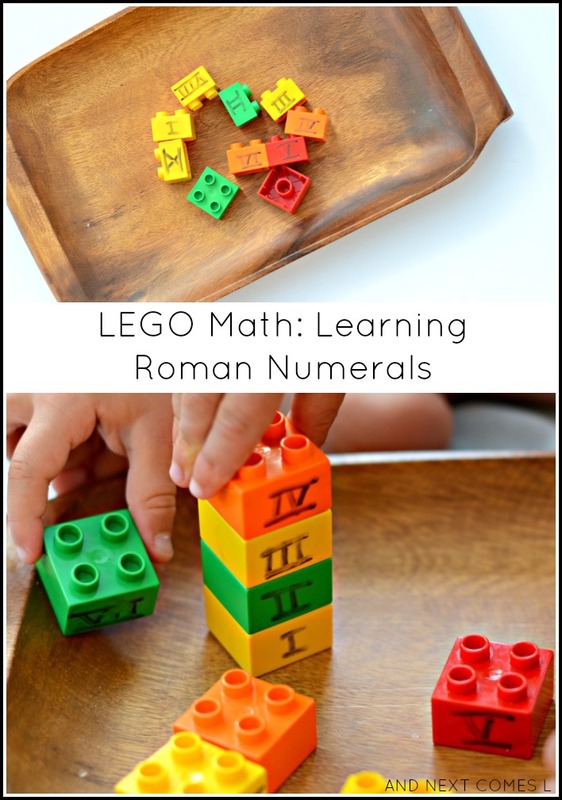 First up, is this simple fine motor LEGO math tray that focuses on recognizing and putting the Roman numerals in order from I to X (one to ten). Even my three year old could almost do this activity independently. He catches on quickly to whatever his big brother is learning. I'm not entirely sure where J picked up Roman numerals from, but honestly, it's the perfect blend of his two favorite things: letters and numbers. It's like Roman numerals were designed for kids with hyperlexia and hypernumeracy. So I'm not surprised that he would be drawn to them. And I must admit, that I have had to brush up on some and learn completely new ones that I didn't know (basically, I didn't know anything from 40 and up). I personally love that his interests force me to relearn or learn new skills. Dry erase marker - Window markers work great too! I simply labeled the LEGO bricks with the dry erase marker with the numbers I to X. Then I scattered them on a tray. Then I let the boys work together to put the Roman numerals in order.